It’s that time of the year – AccSoc Director & HR Subcommittee Recruitment 2019! We are on the lookout for passionate and keen individuals who are ready to make their mark on our community of students. This opportunity is a great chance to further your university experience and develop yourself beyond what you thought was possible! Whether it’s leading your OWN subcommittee, or planning and discussing the strategic direction of AccSoc, you’ll be getting the best experience in motivating yourself to be a stronger leader and overall all rounder. 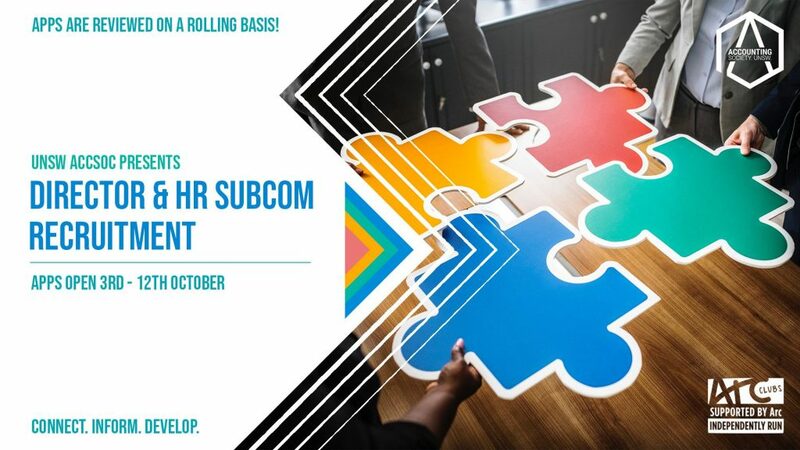 And for those of you eyeing HR Subcommittee, this early recruitment is a great chance for you to be involved behind the scenes and get a real taste in improving your planning and organising skills for the future! Aside from that, you’ll be working hard to improve and work with the strong AccSoc culture that has been maintained and become part of the AccSoc fam! This year AccSoc has experienced rapid growth, and we are more than excited to welcome a new batch of fabulous directors and HR subcommittee into the midst. You might be more tech oriented, or maybe you’re a confident speaker – whatever your goals, there will be a role for you! Applications close 11:59PM on the 12th of October. These applications will be marked on a ROLLING BASIS and those applications moving forward will be contacted for information regarding interview and commitment. Get your applications in quick! We look forward to reading them. Goodluck! ← UNSW AccSoc Presents: What An Accounting Major Can Do For You?